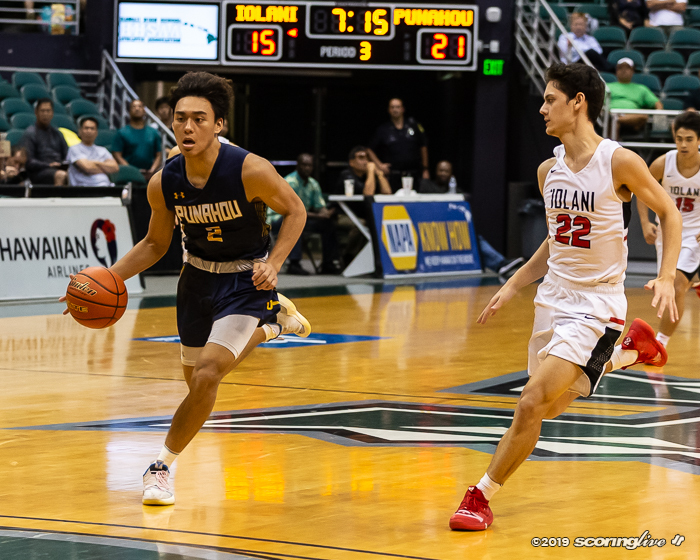 MANOA — No. 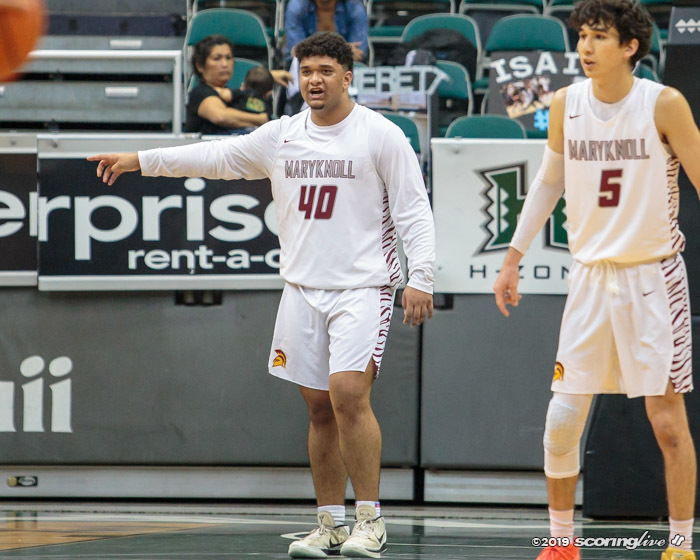 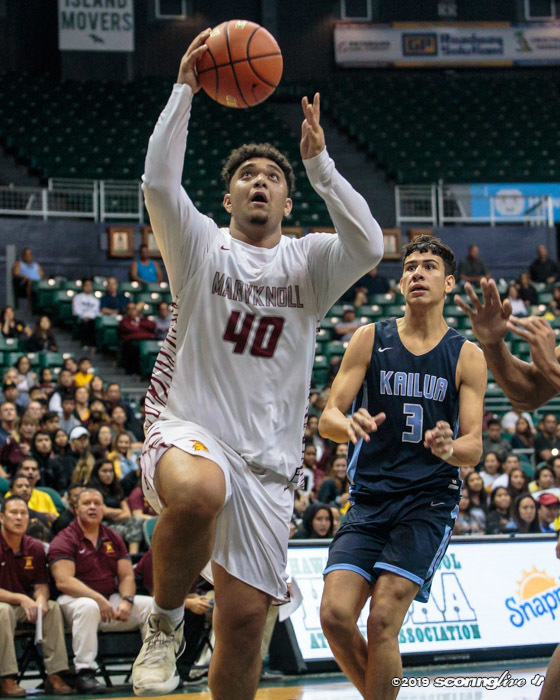 1 and top-seeded Maryknoll will be looking for its first state title since 1984 when it plays No. 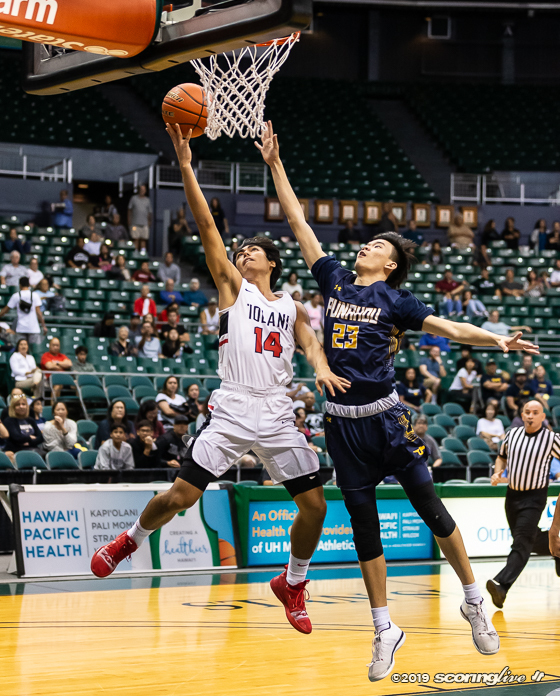 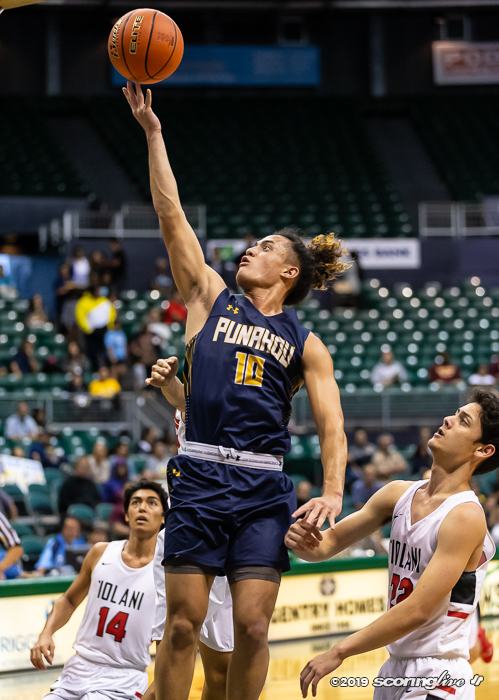 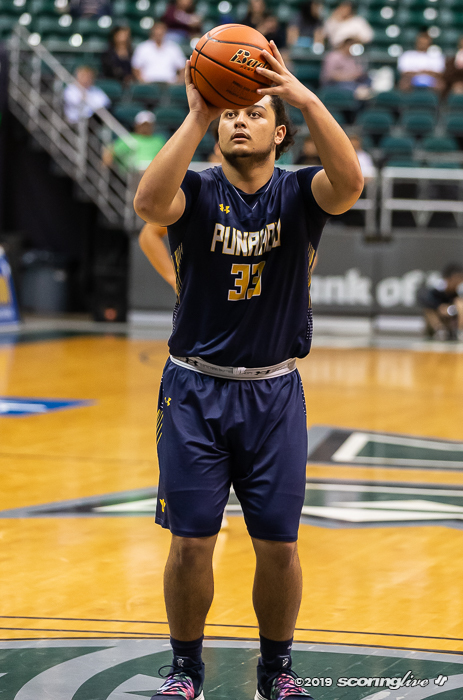 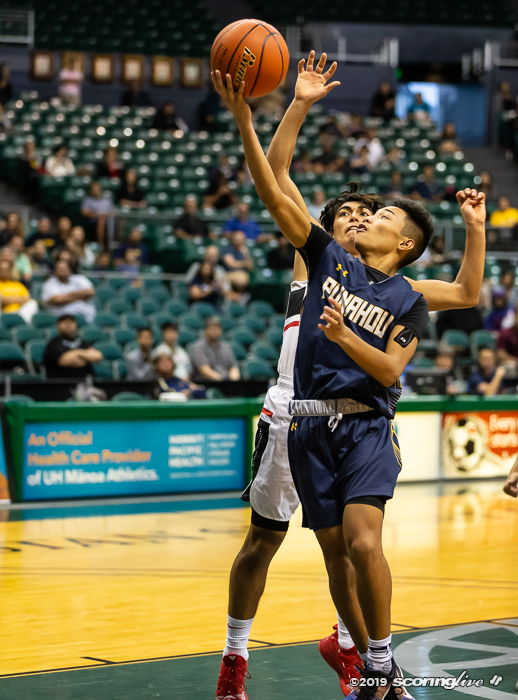 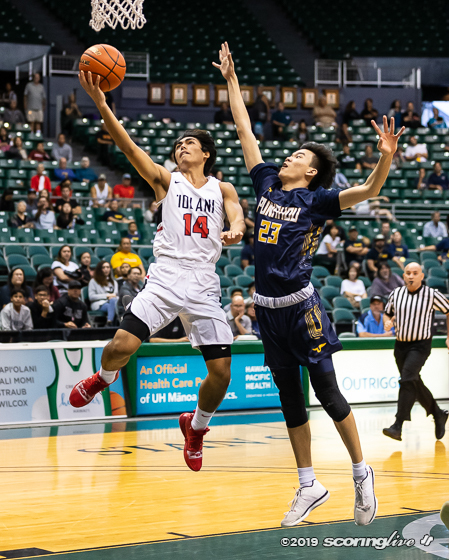 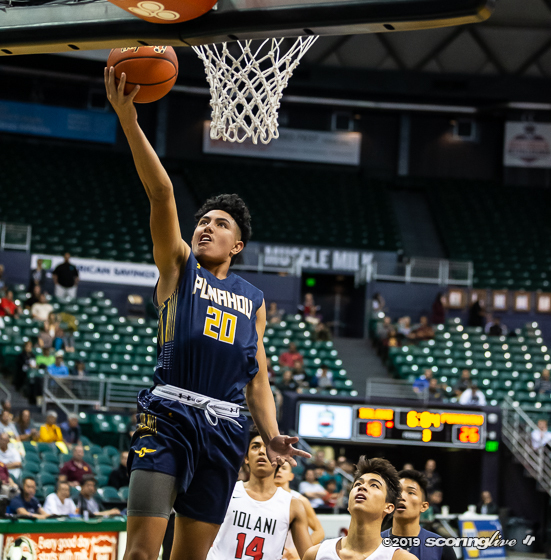 2 and defending champion Punahou in an all-Interscholastic League of Honolulu finale 7 p.m. Saturday at the Stan Sheriff Center. 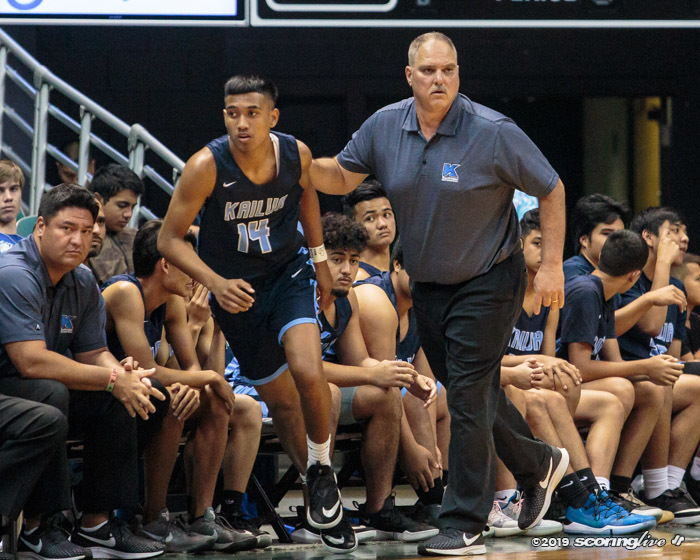 The Spartans advanced with a 47-29 win against Kailua, while the Buffanblu moved on with a 48-42 win against No. 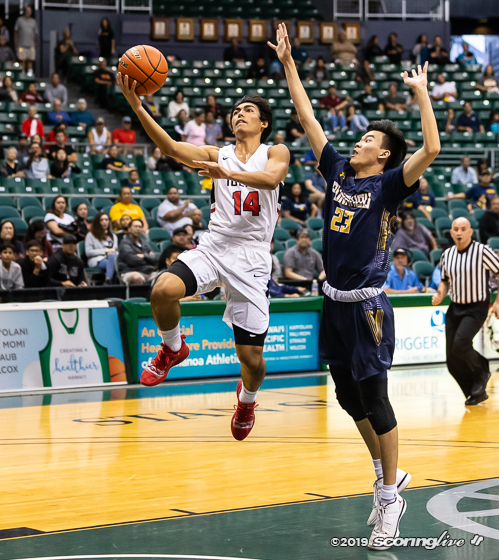 3 Iolani in the Snapple/HHSAA Division I state tournament semifinals Friday at the Sheriff Center. 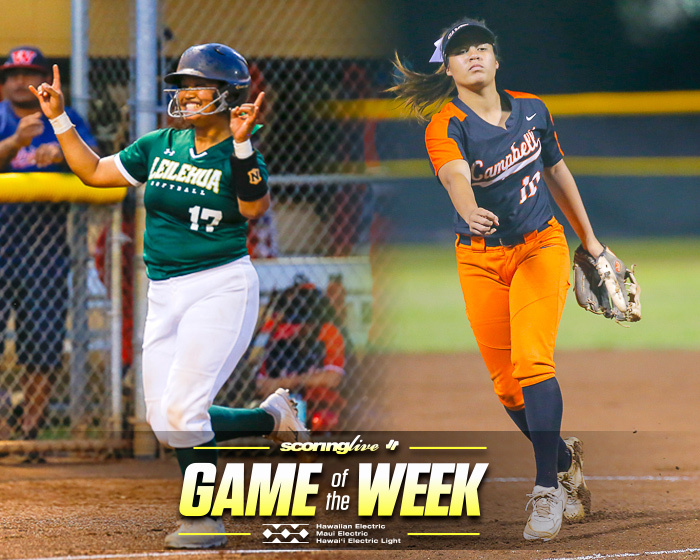 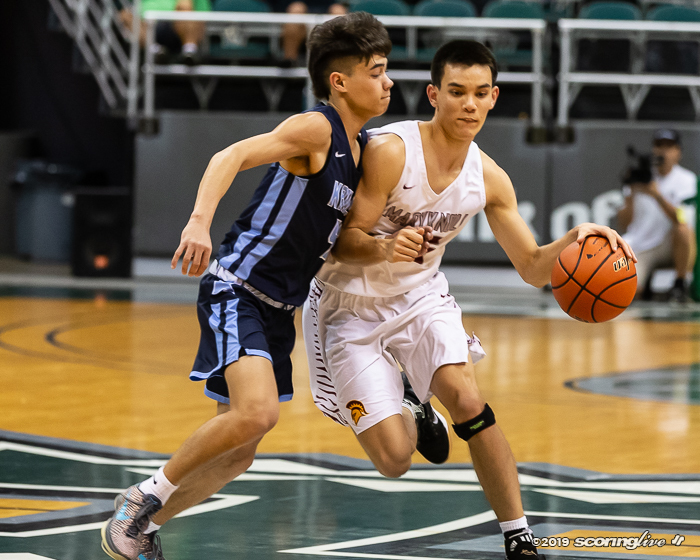 The Spartans (29-2) have beaten the Buffanblu (29-5) in all three meetings during the ILH season. 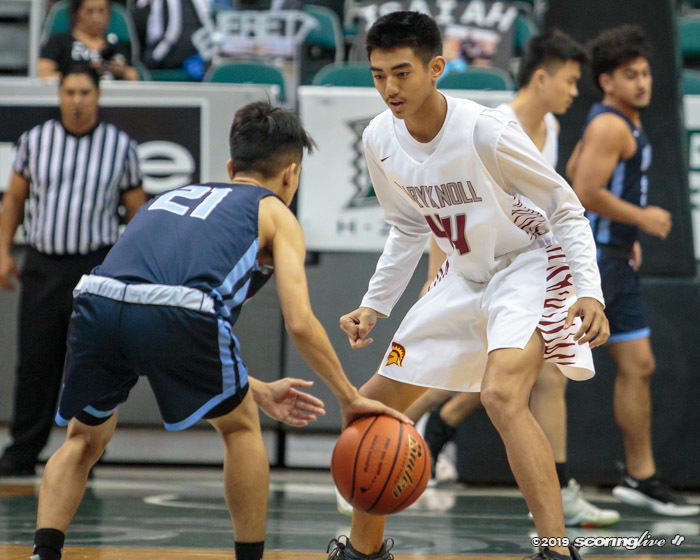 "It's going to be an exciting game," Maryknoll coach Kelly Grant said. 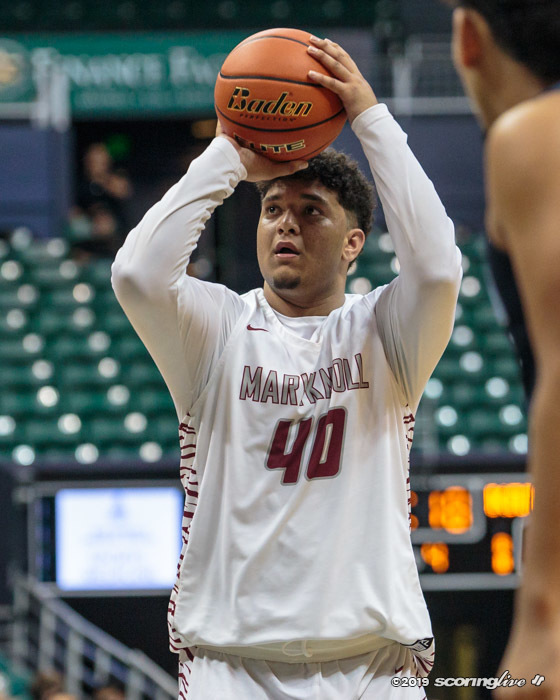 "It's hard to beat somebody four times." 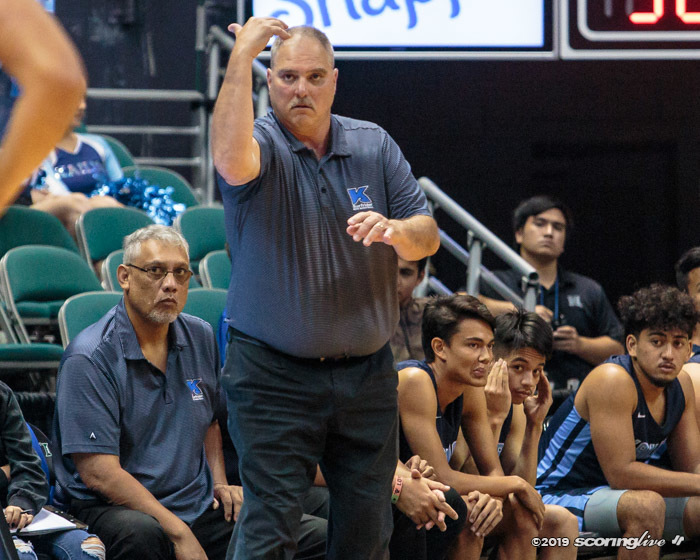 While it has been 35 years since the Spartans have won it all, it will not be a first time for coach Grant, who was a member of that '84 title team. 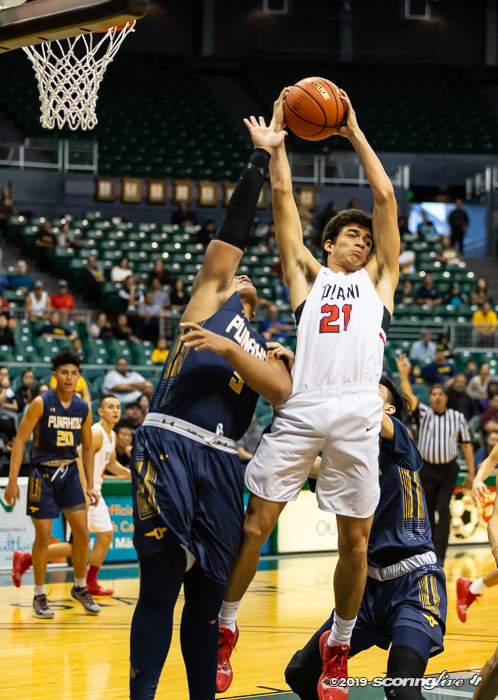 But it will not be a first-experience either for his sons Payton and Parker. 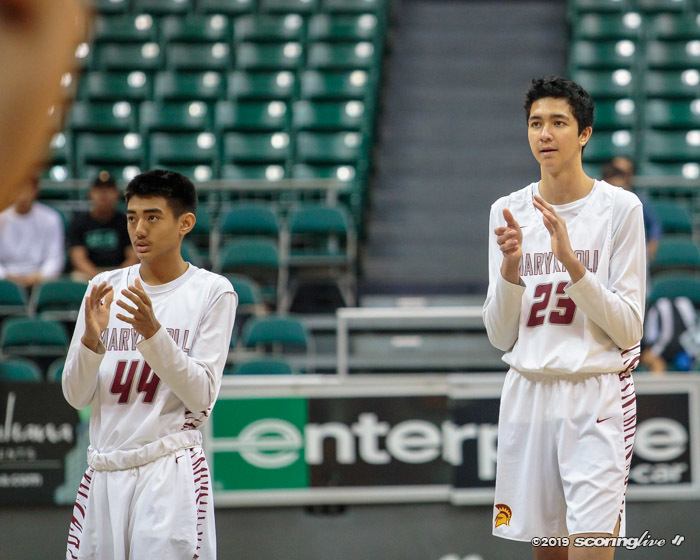 Both were ball boys when their father led Kaimuki to the 2007 championship, coincidently, against Punahou. 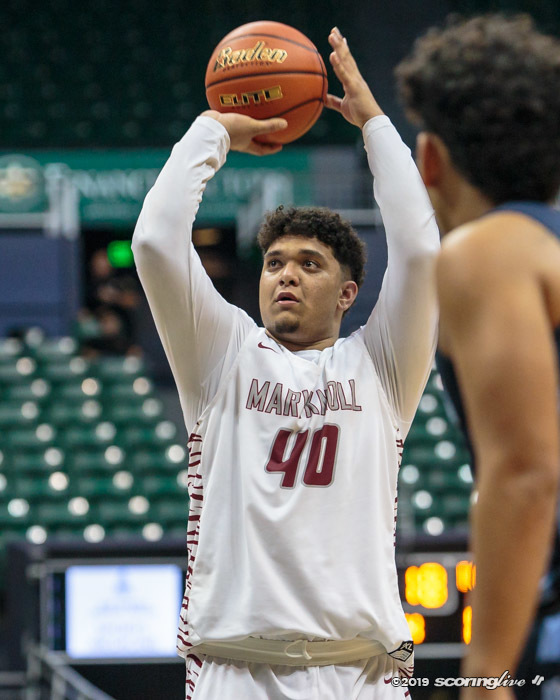 "As a ball boy, I couldn't really play on the court," said Payton, a senior. 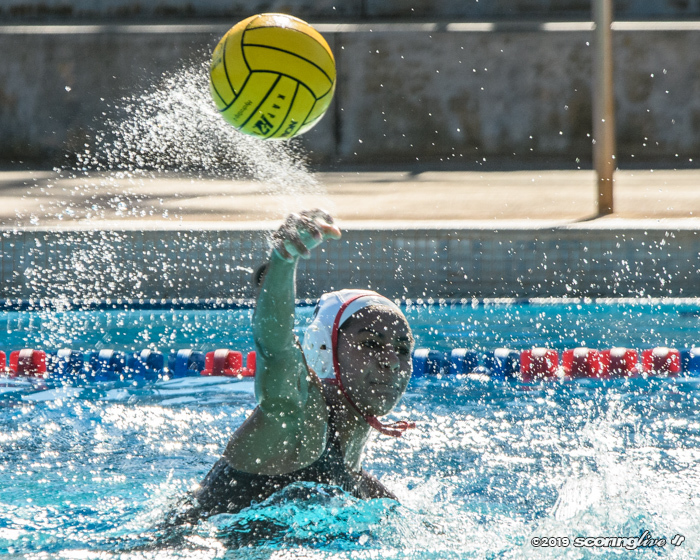 "As a player, now I'm doing it myself with my teammates, which is really great." 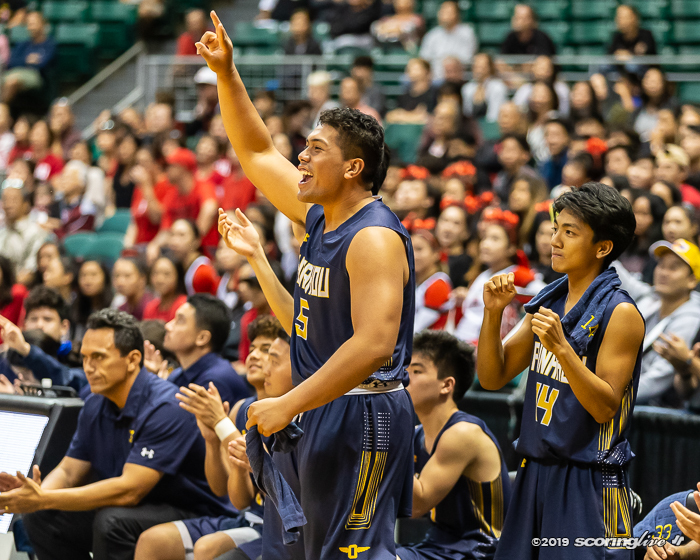 With this being the fourth meeting of the season between Punahou and Maryknoll, there are no secrets. 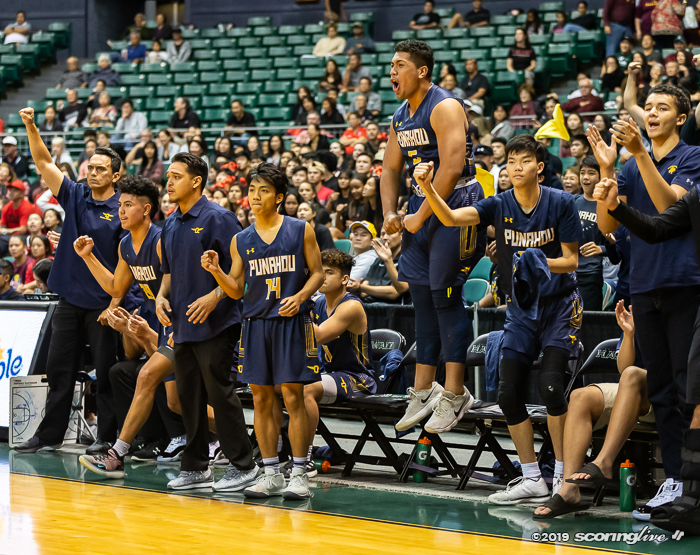 "These kinds of game, it's going to whoever deals with it mentally better or gets some of the breaks," Punahou coach Darren Matsuda said. 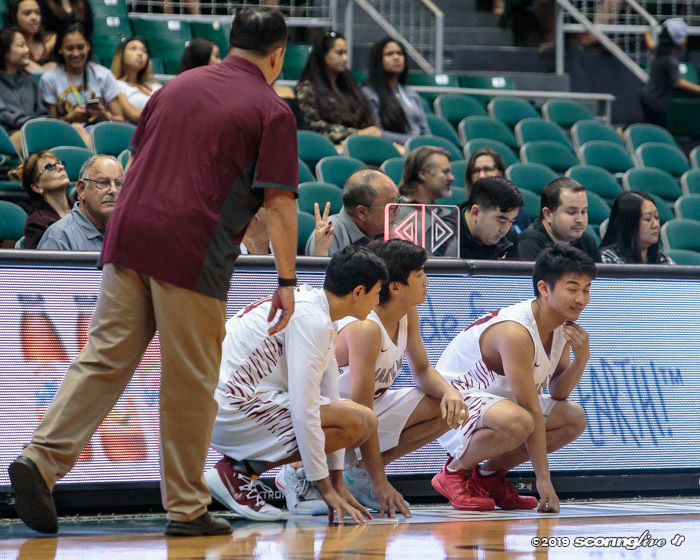 "That's what happens in championship games." 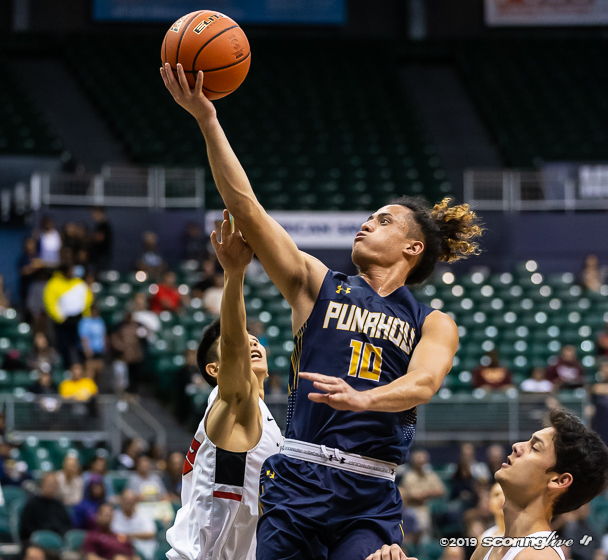 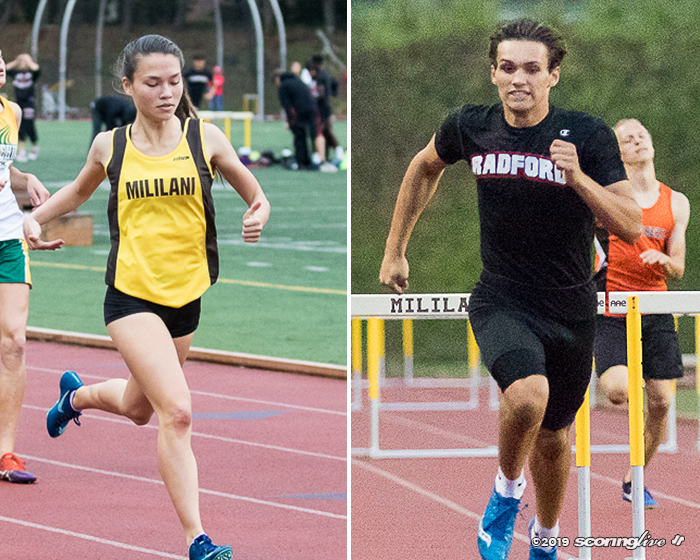 Punahou is seeking its unprecedented 12th state title; it is tied with Iolani at 11. 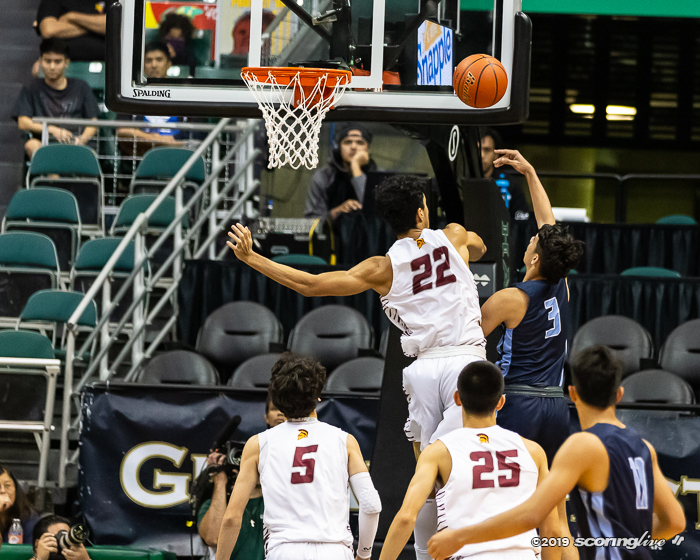 Ironically, the D1 and D2 title games feature teams in the same neighborhood. 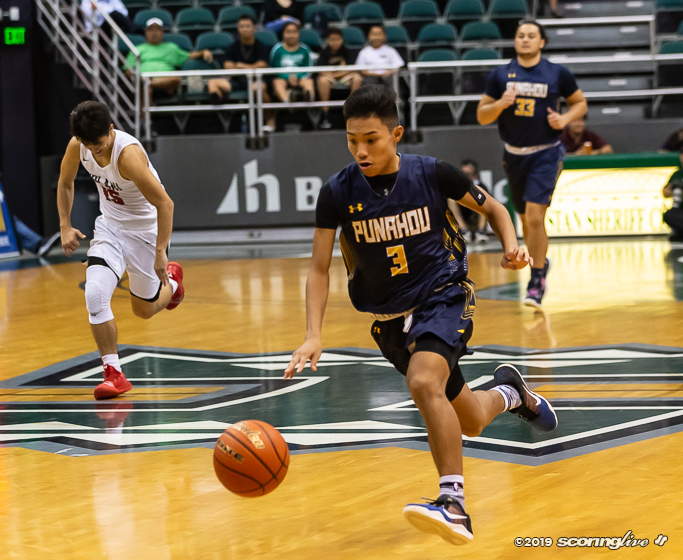 Punahou is directly across Wilder Avenue from Maryknoll. 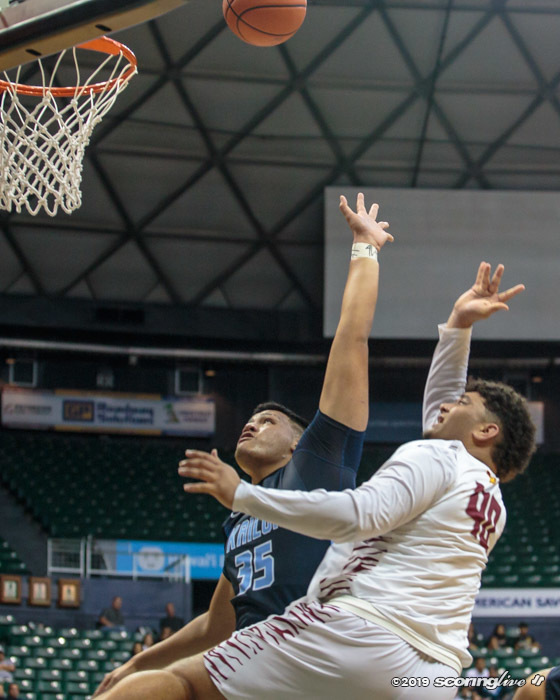 In D2, Farrington and Damien are diagonally across from the other on Houghtailing Street. 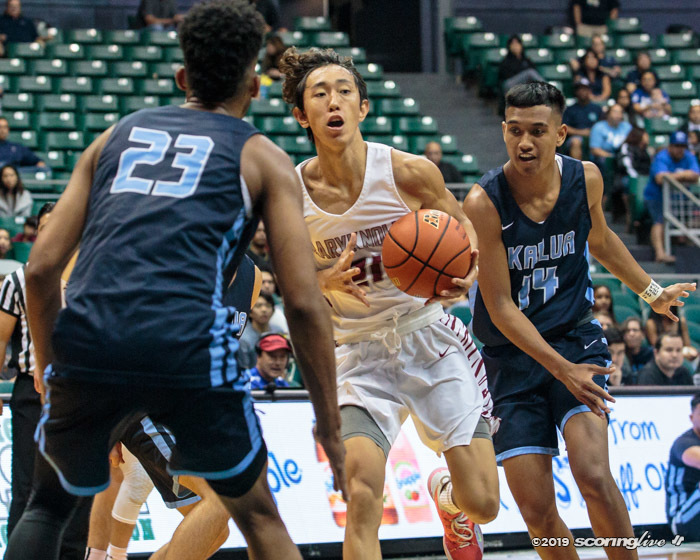 Makoto Kamata had a game-high 17 points to lead the Spartans in a runaway win in which his team shot 53.3 percent from the field. 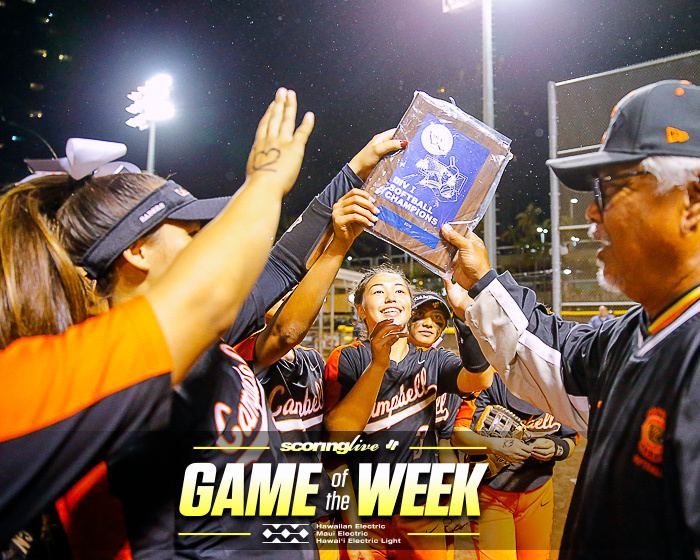 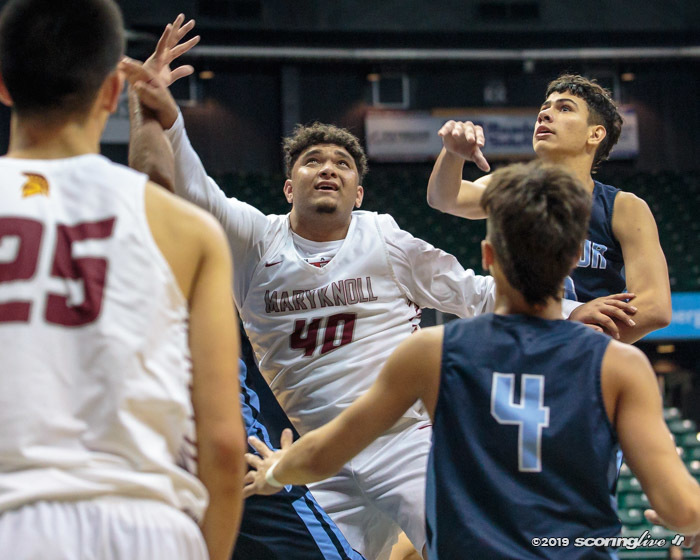 "Right before this game I watched the replay of last year, when we lost (to Kahuku) in the semis," Kamata said. 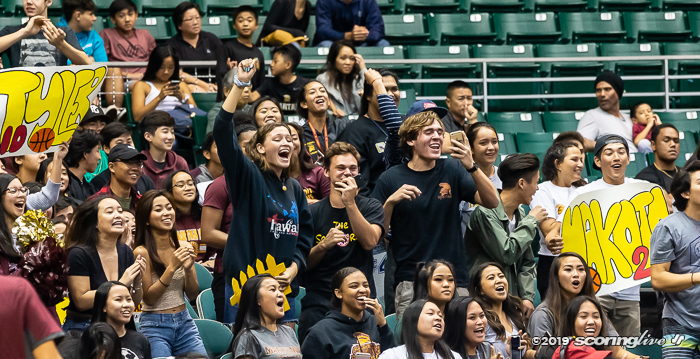 "I just had that in my head the whole time. 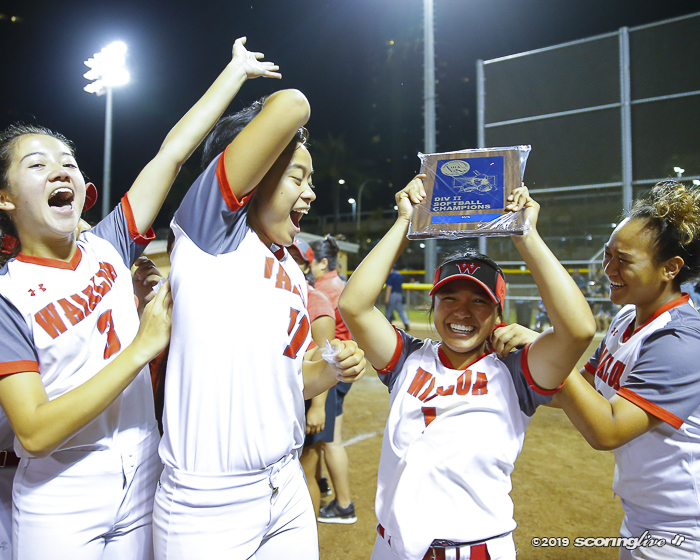 I just did not want that to repeat from last year." 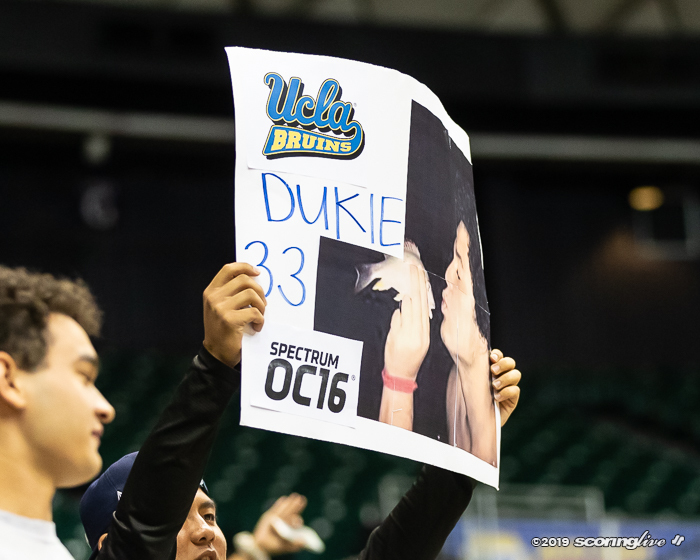 Meanwhile, the No. 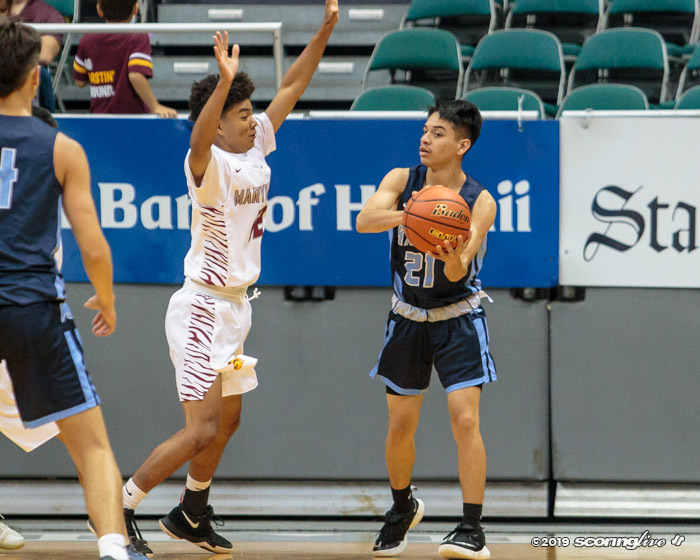 7 Surfriders (20-13) shot a dismal 20 percent. 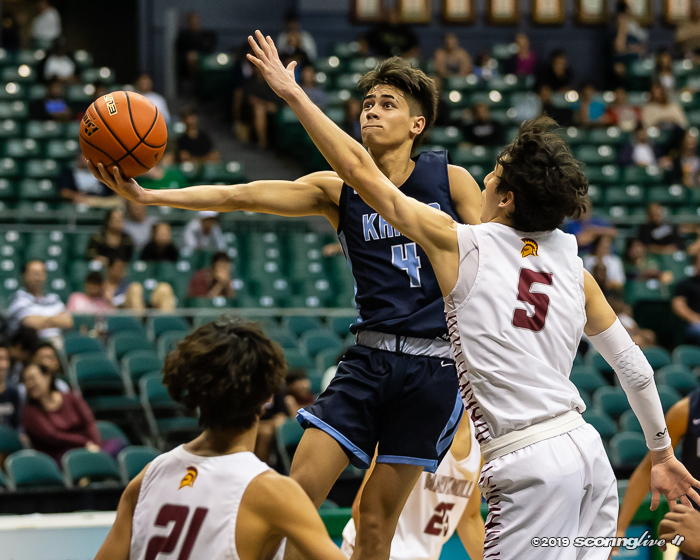 Everett Torres-Kahapea led Kailua with 17 points with nearly half his scoring from free throws; he was 4 of 19 from the field, including 0 for 11 from three-point range. 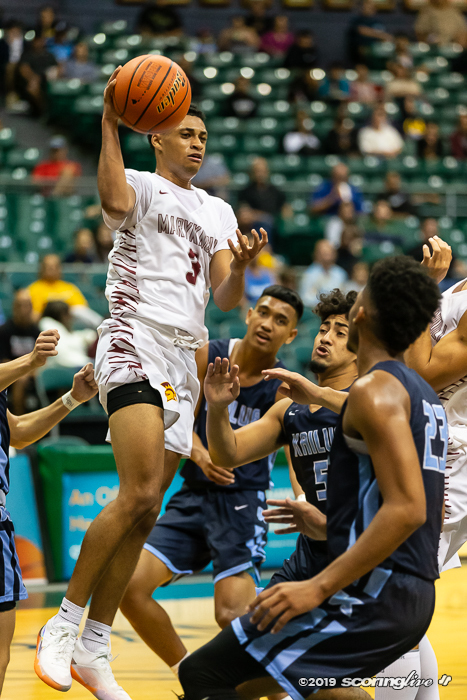 While the teams were nearly even in rebounding — Maryknoll's 29 to Kailua's 28 — coach Grant was concerned that Kailua had 14 offensive boards. 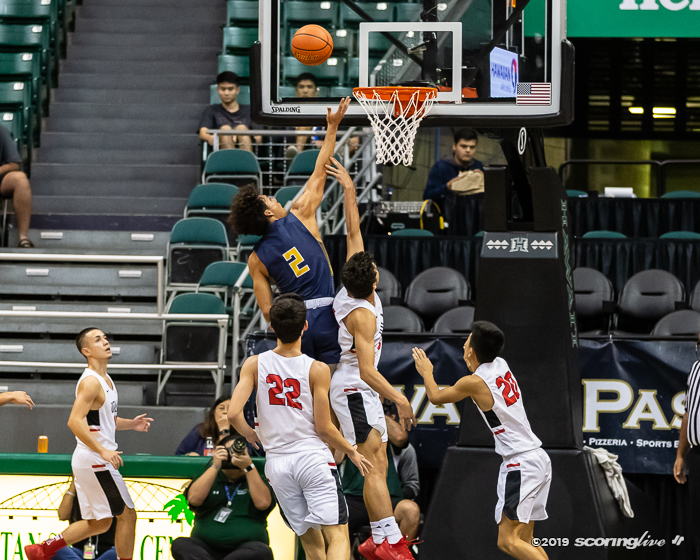 "I was disappointed with the team's effort on the defensive rebounds," coach Grant said. 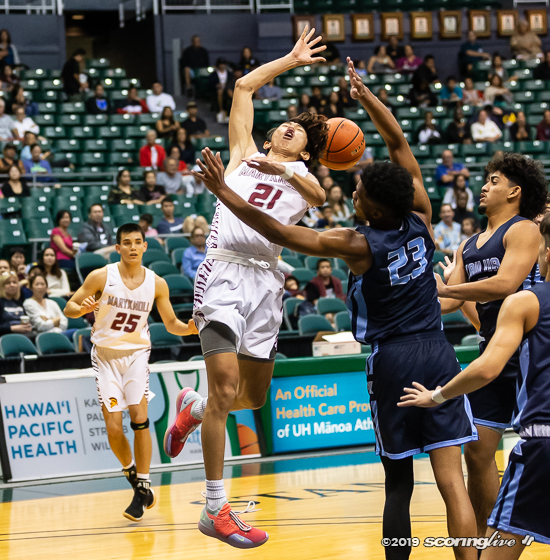 "(The Surfriders) had way too many offensive rebounds." 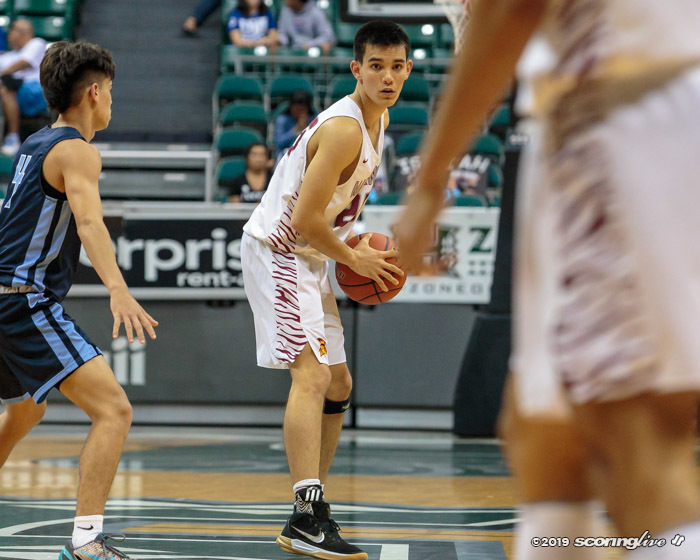 Payton Grant led his team with nine rebounds, all on the defensive side. 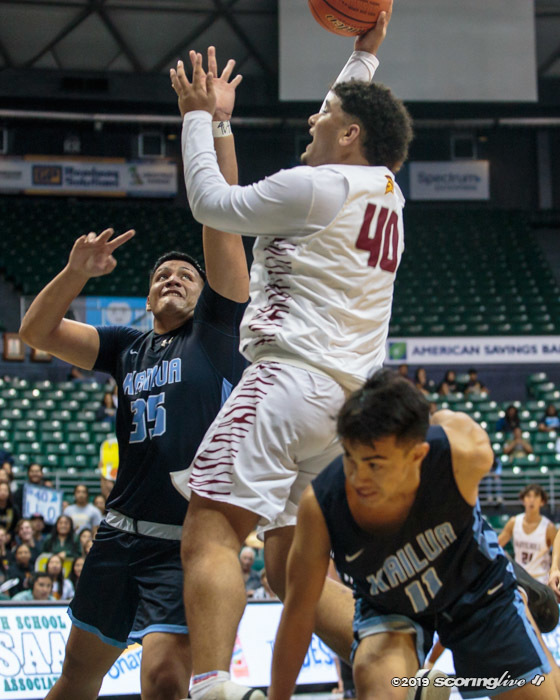 What helped the Spartans is the Surfriders managed only four second-chance points. 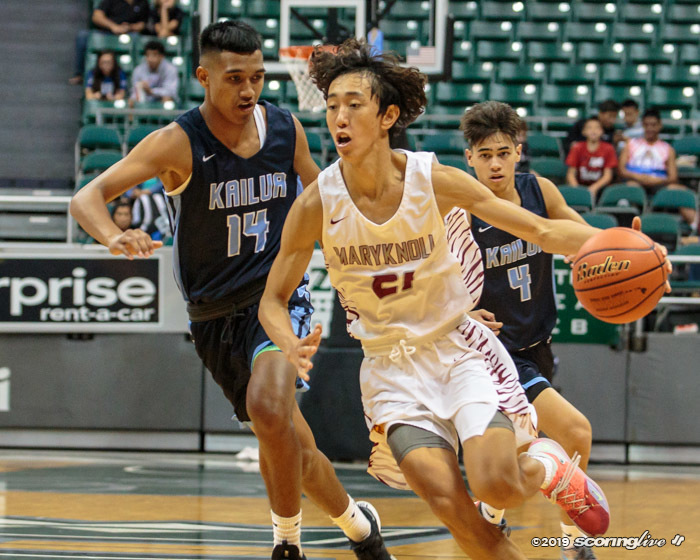 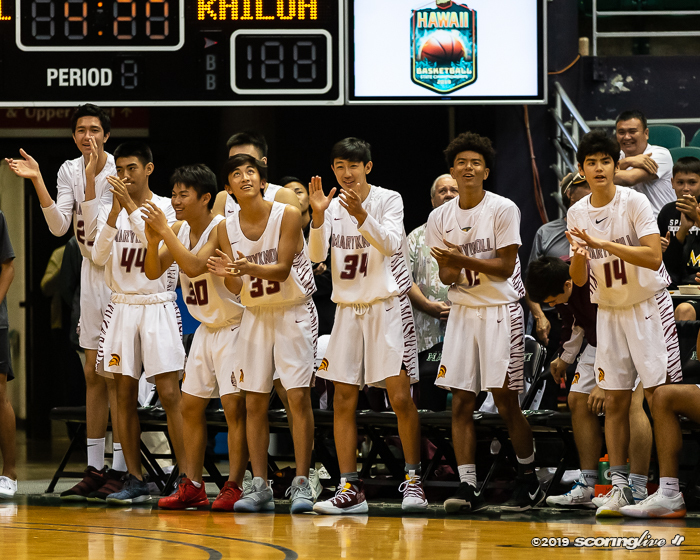 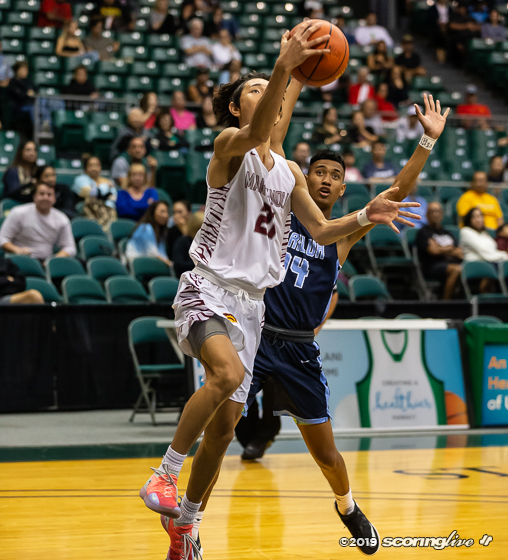 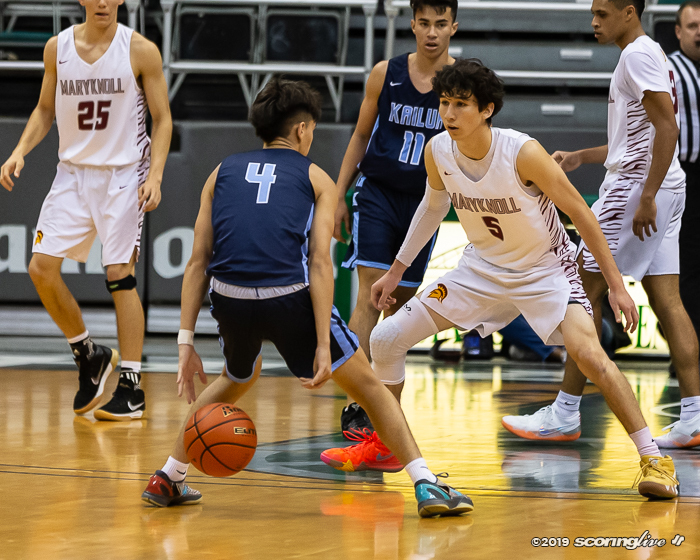 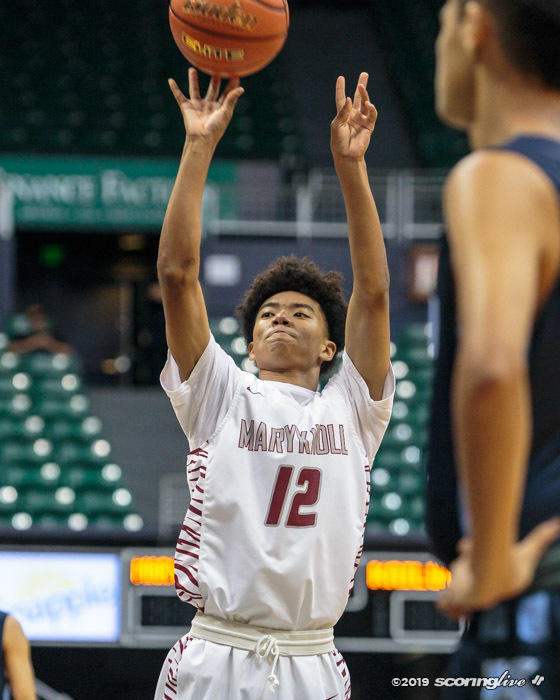 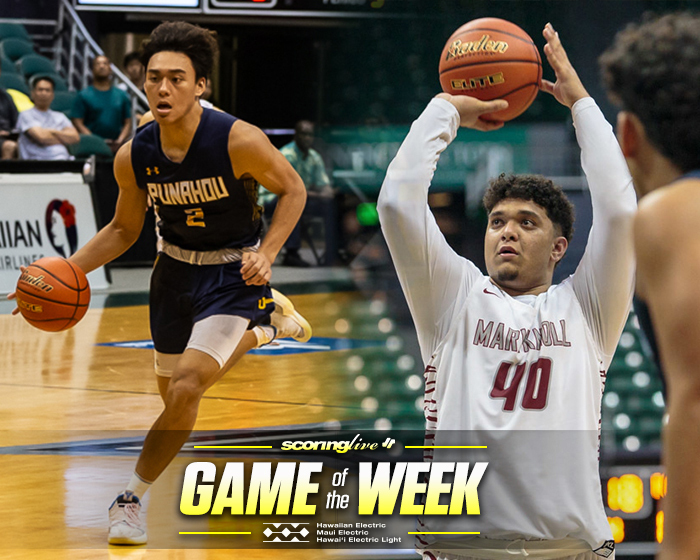 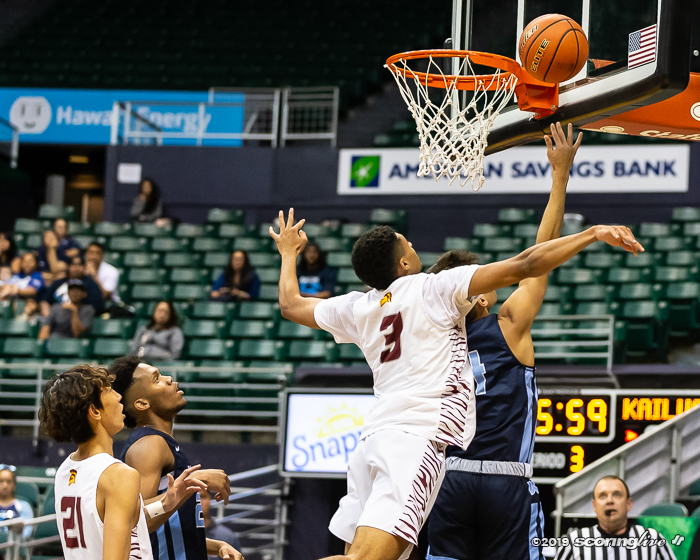 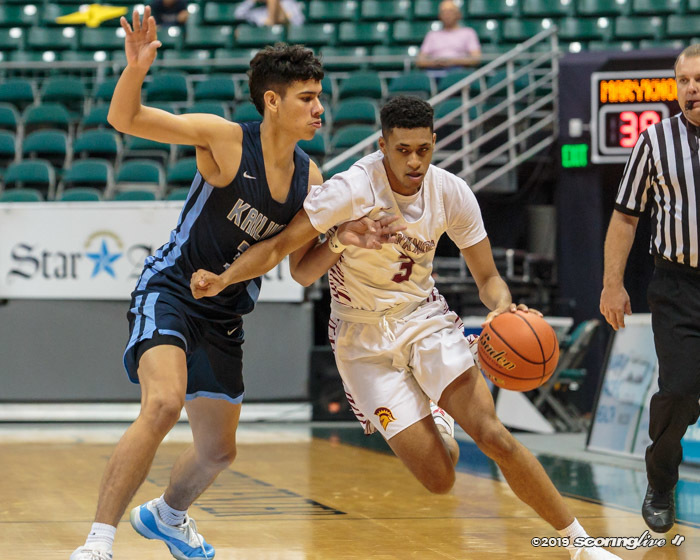 Maryknoll dominated from the start, opening the game with an 8-0 run as Kailua did not score until one minute, 25 seconds left in the first on a 3-pointer by Kalai Akaka. 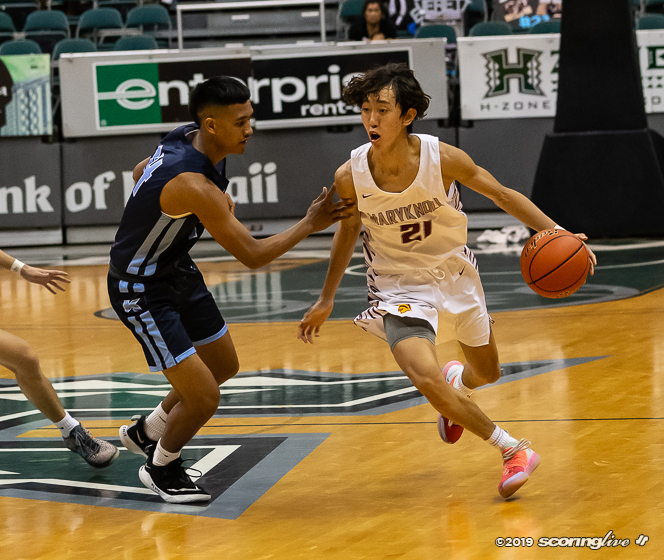 The Spartans took a 20-7 lead at the half. 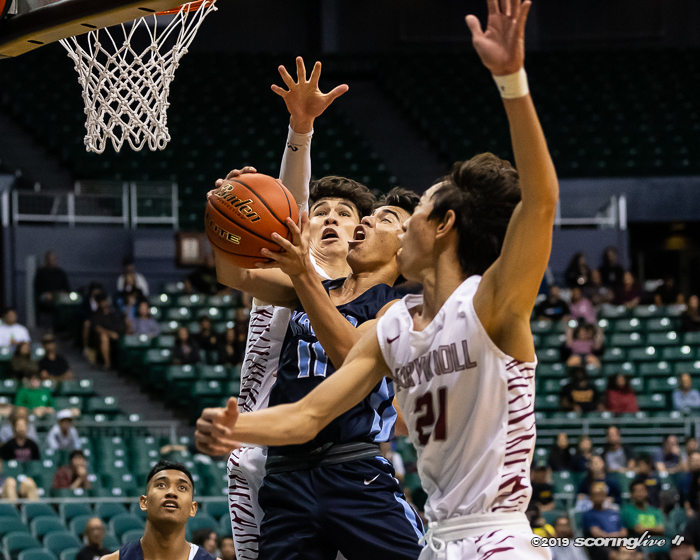 The seven points by Kailua tied a state tournament record for the fewest points in a half (Honokaa vs. Kamehameha in a 2008 play-in game and Mililani vs. Kalaheo in the 2013 quarterfinals.) 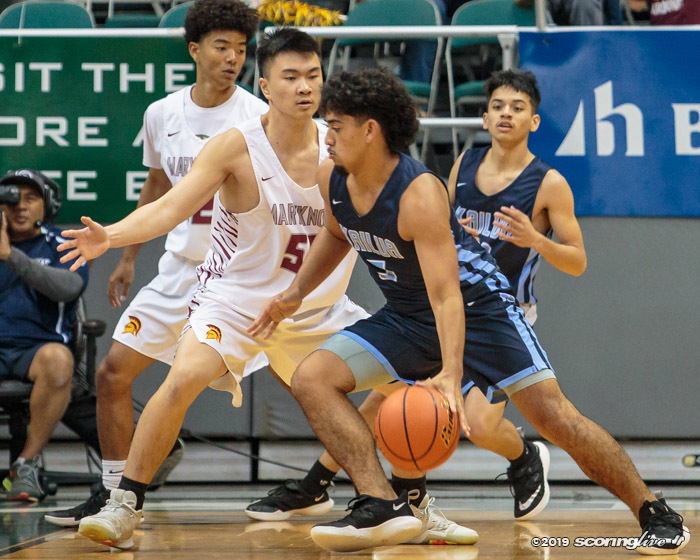 Kailua shot 3 for 22 in the half. 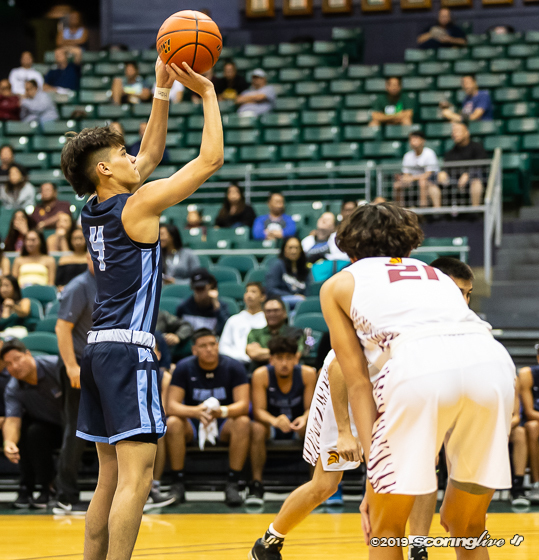 The longest run by Kailua was six points in the third, yet all that did was pulled the Surfirders to 39-19. 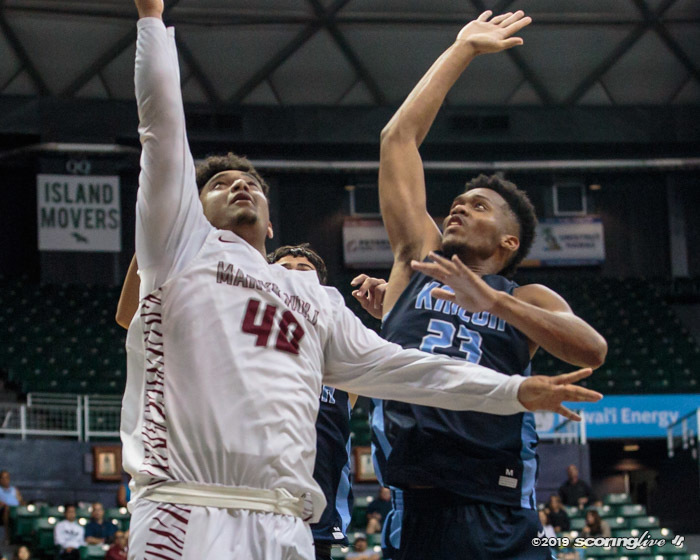 The Spartans increased their margin after that. 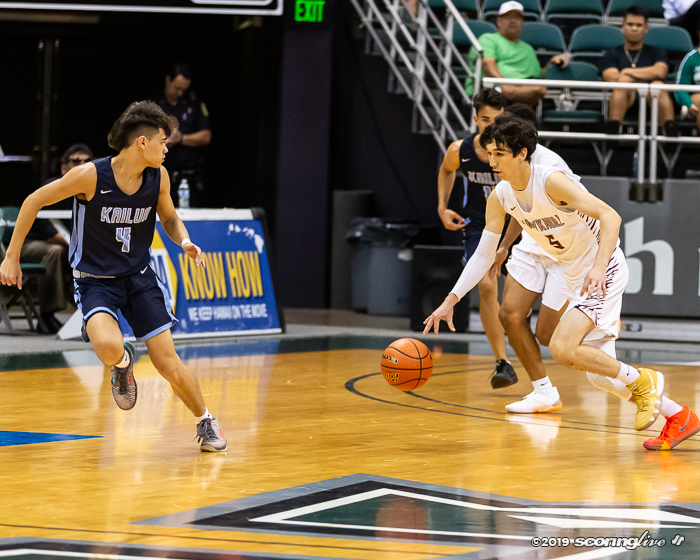 Duke Clemens and Jakob Kimura combined for 30 points — 15 each — to send the defending champs to the title game for the fourth consecutive year. 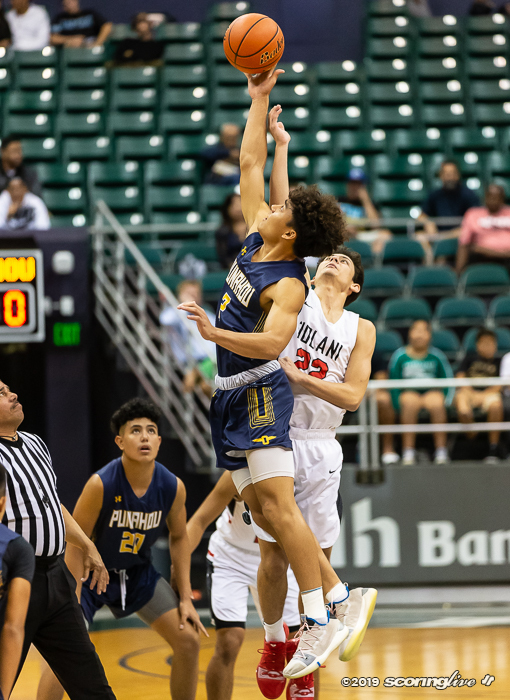 The Buffanblu scored half their points inside the paint in a game that saw five lead changes. 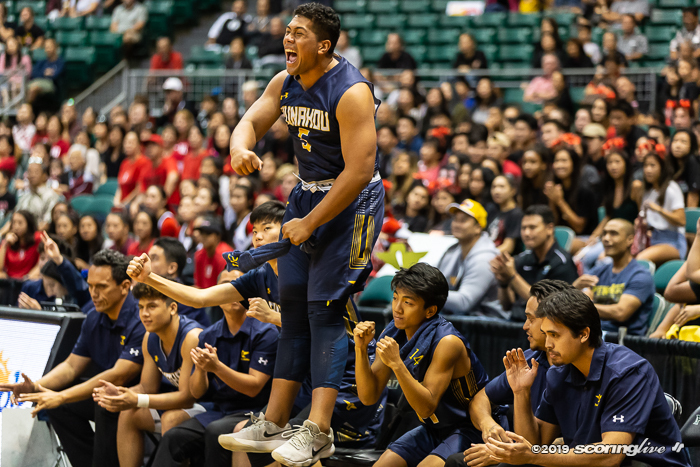 "It was just fun to compete," said Clemens, one of four seniors who will be playing in the title game for the fourth time (the others being Maninoa Tufono, Les Falatea and Kaulana Makaula). 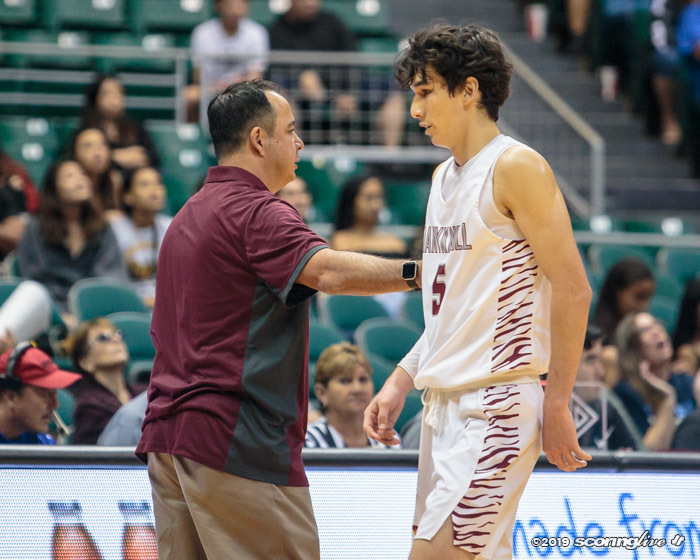 "All the work from little-kid days, all the things I've learned in my career ... just being in those moments. 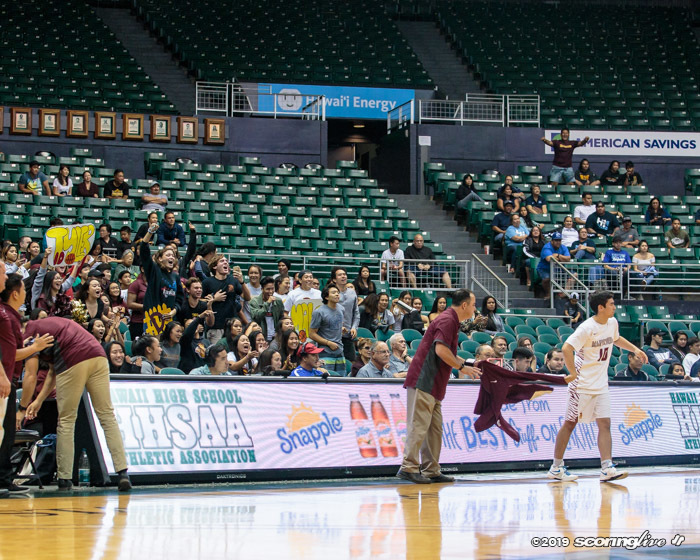 You have to love it." 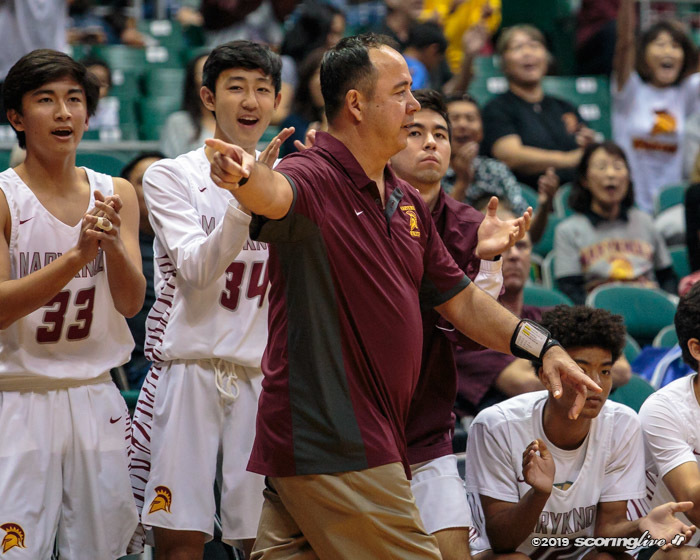 "I think for these seniors — a lot of them have been with us for four years — I think it's a special thing," Matsuda said. 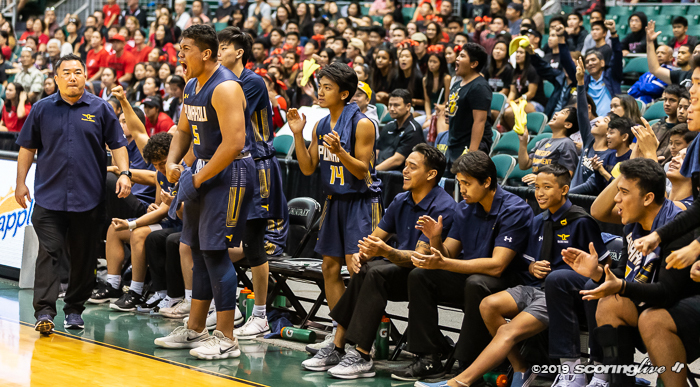 "This is our opportunity and that's all you can ask for." 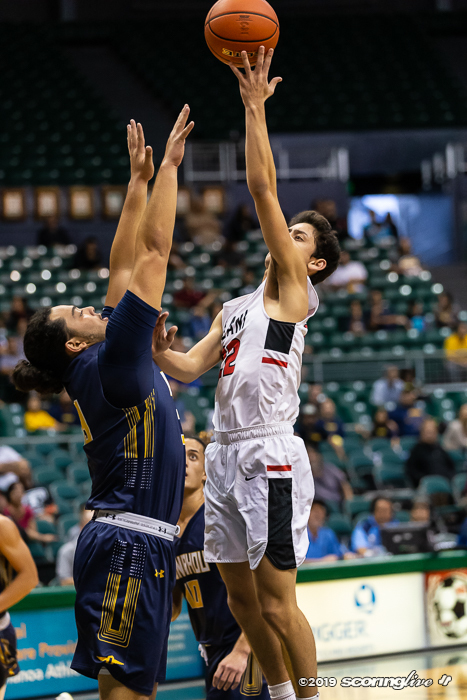 Iolani (20-12) had three players score in double figures — Frank Felix with 14, Kawika Lee with 12 and Sam Wheeler with 10. 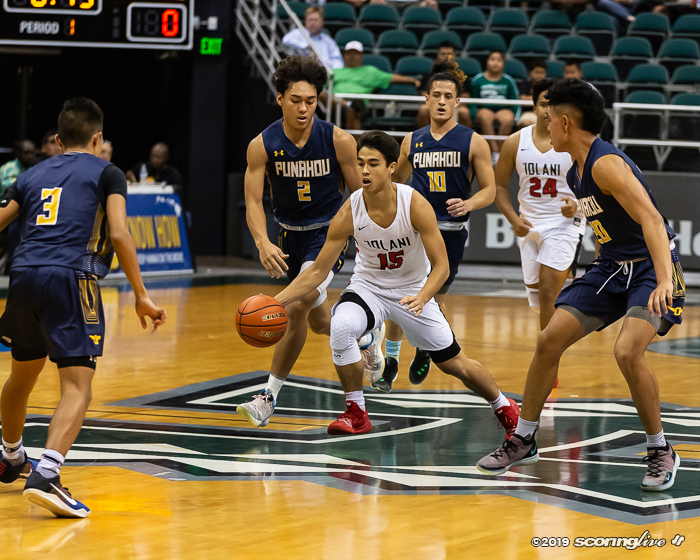 It was a defensive battle. 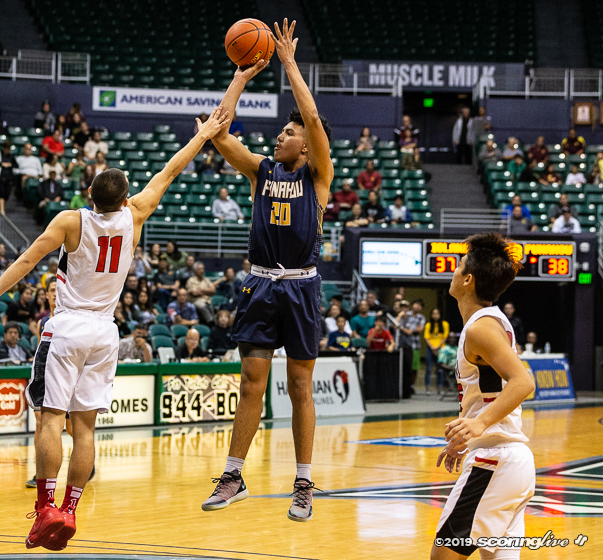 Punahou shot 14 of 34 from the field to Iolani's 13 of 38. 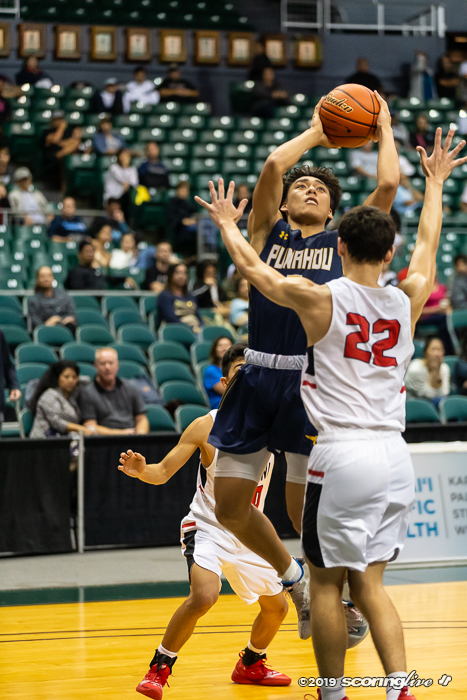 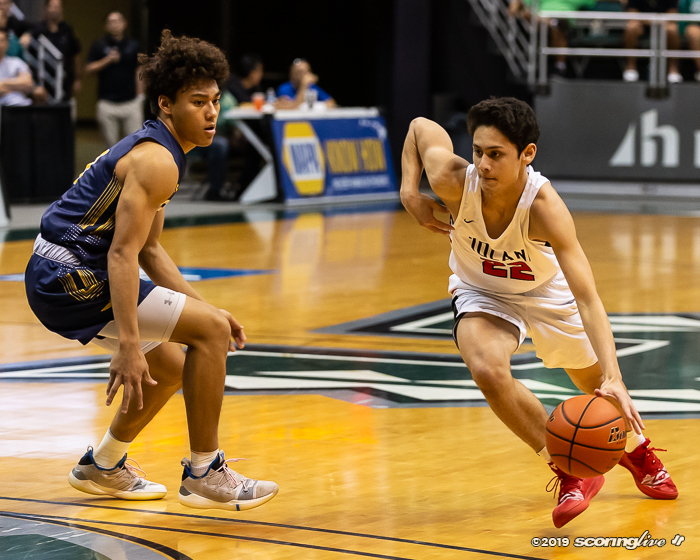 In the second period, the Buffanblu forced 11 turnovers, yet managed six points, keeping the game close with Punahou taking a 19-15 lead into the break. 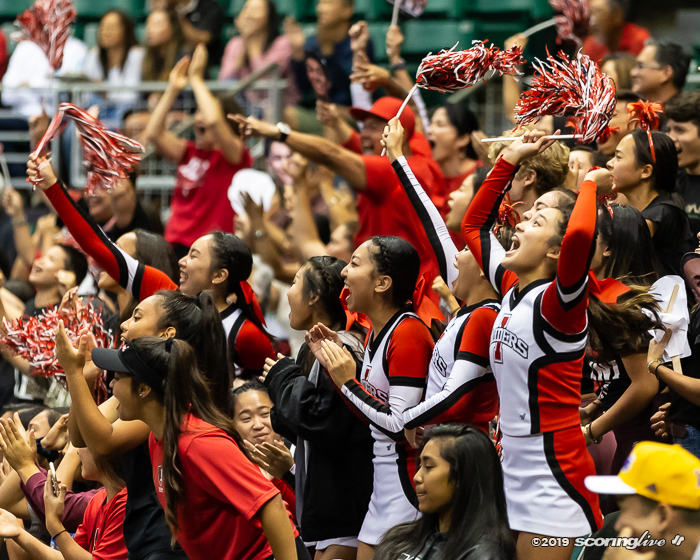 "I guess it was kind of like (the past) Super Bowl," Matsuda said. 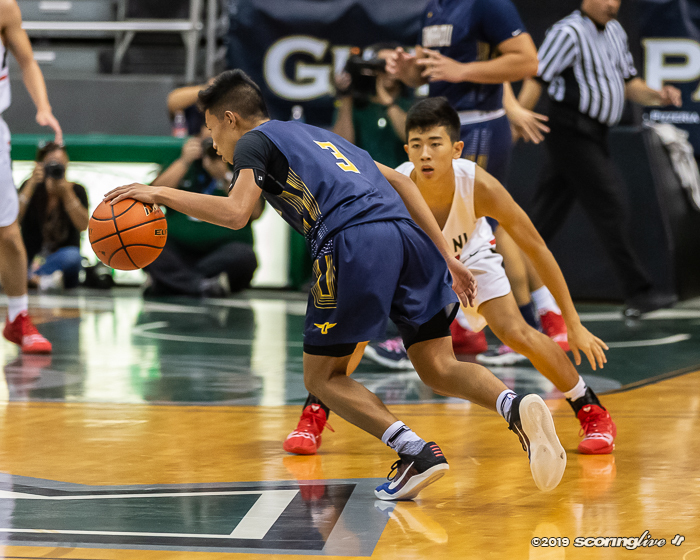 "It was ugly, for both sides I'd say. 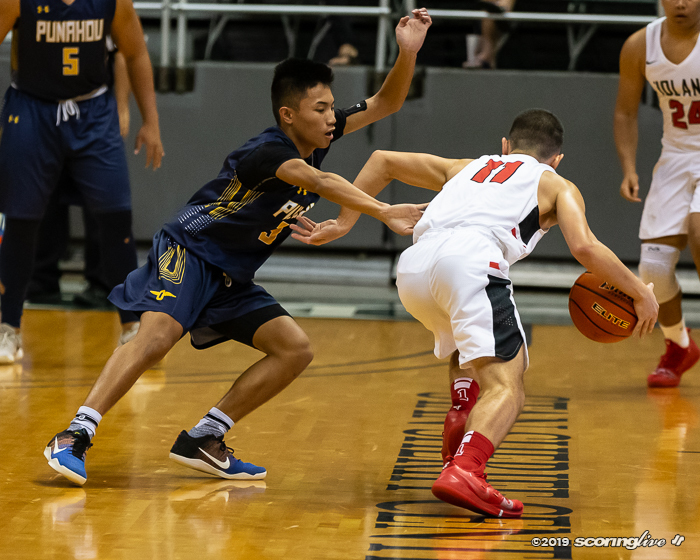 It wasn't a pretty game, but both teams played really good defense. 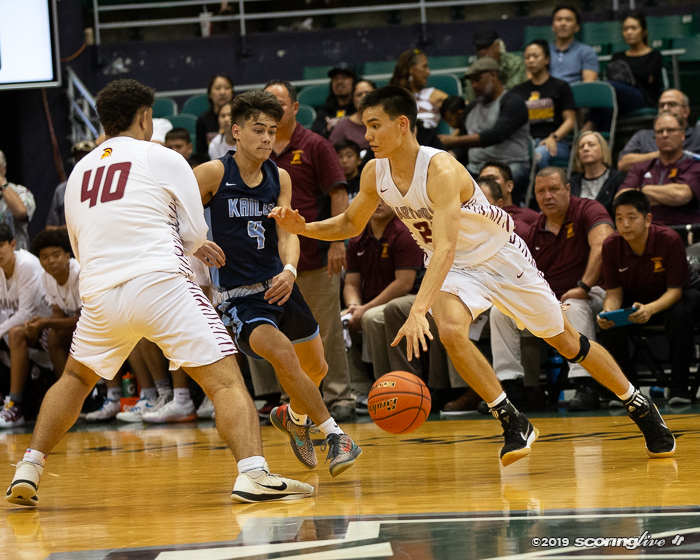 I'm sure both teams would've like to have executed better and I knew when the second half came around, both teams would." 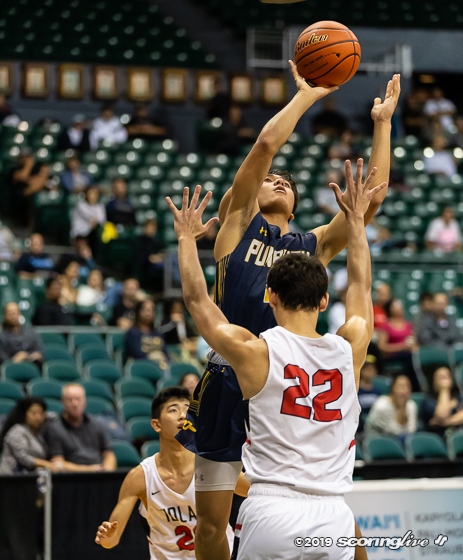 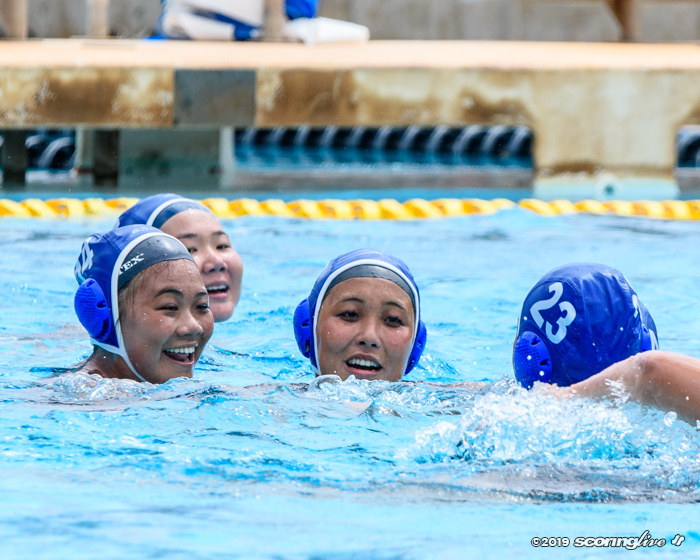 Punahou opened its lead to as many as 10 points three times in the third period. 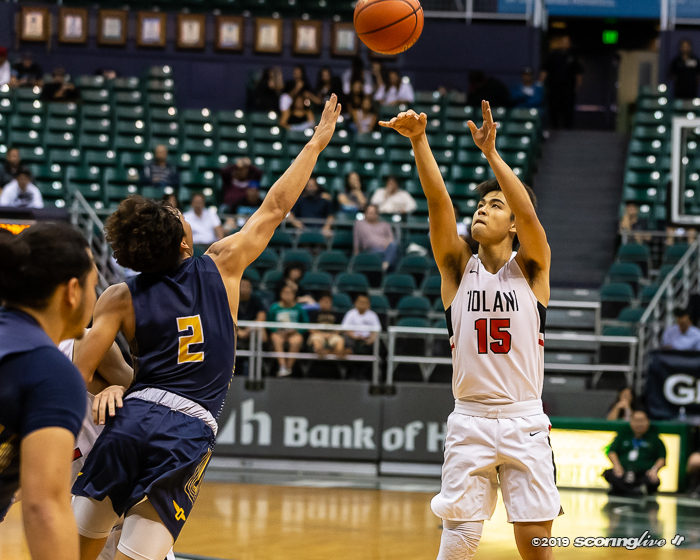 But Iolani drained three consecutive 3-pointers late in the quarter to take a brief 35-34 lead at 1:51. 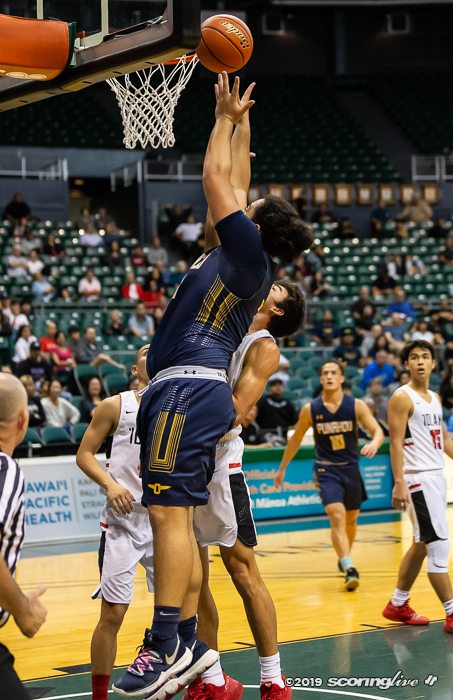 But Punahou ended the quarter with a 4-0 run, the last two points off a turnover, to open its lead to 38-35 entering the fourth. 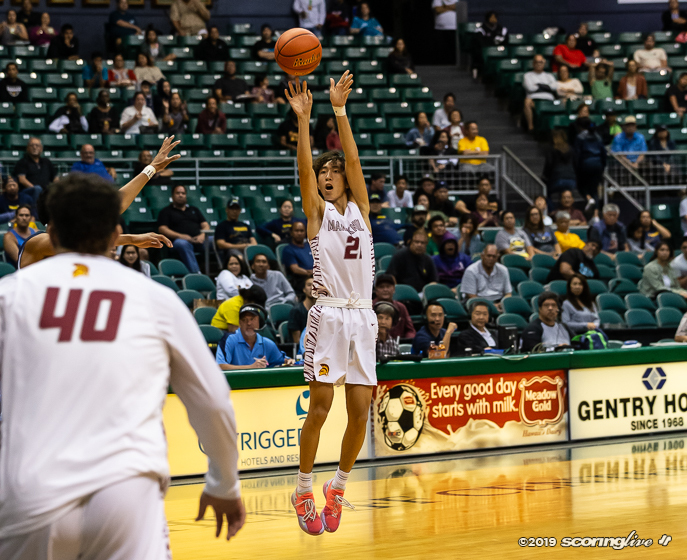 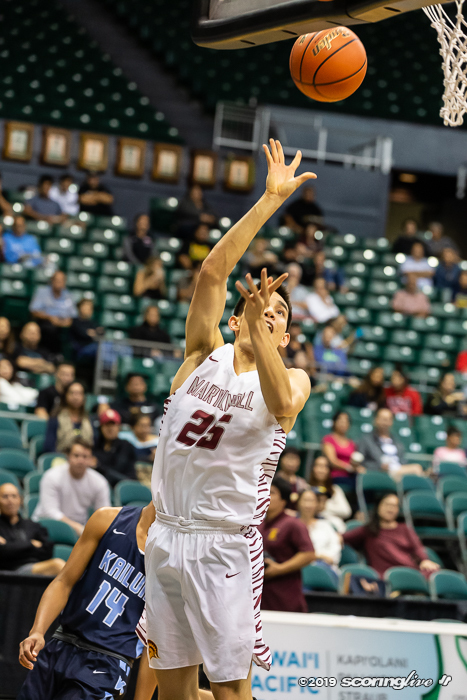 The Raiders kept it a one-possession game with 37 second left on Wesley Yamada's second 3-pointer of the game. 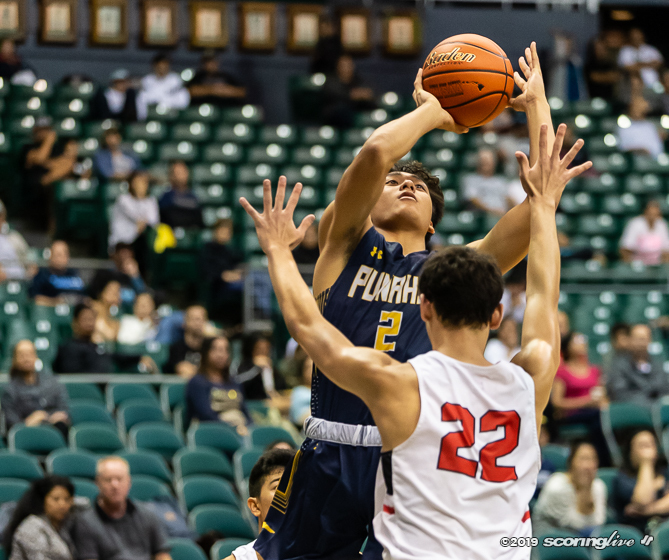 But having to foul to regain possession, Punahou made 3 of its last six free throws to seal the game.